The harlot riding on the scarlet beast. Last week, we covered the seven bowls of wrath. After the seventh bowl, which corresponds with the seventh seal and the seventh trumpet, Christ returns. As you know, Revelation is not linear. It is a series of visions showing what must take place. After the seventh seal, the voice from the throne said “it is done.” This signifies that the age is complete and God’s kingdom is being established. It is a reminder of the “it is finished” spoken from the cross. All of human history has been part of God’s plan. After this, Babylon is given the wine cup of God’s wrath. Chapter 17 of Revelation turns John’s vision in a different direction again with a description of Babylon—the great whore. The angel with John explains the vision, although it can be rather confusing. Revelation 17 is, perhaps, the most confusing part of the entire book. There is a lot of symbolism here. How is the woman described? Is this a literal woman? Sitting on a beast with seven heads and ten horns – we have already read about the beast with seven heads and ten horns rising from the abyss. In this deeper description, we are told that this dragon is a government, or body of several governments, who will willingly hand over authority to the antichrist. The woman sitting on the dragon indicates that she (figurative) is supported by them. Although, we will see later that they do not like her. Arrayed in purple and scarlet – Several times in our studies, we have discussed the color purple. It is the color of royalty AND it is also the color of the robes of priests in the temple. This could indicate that the woman is a wealthy nation or it could indicate that this is a representation of a false church. Maybe both. Scarlet, in scripture, has several meanings. It can mean wealth (Revelation 18:12), fine material (many passages), a glorious leader (Nahum 2:3), sin (Isaiah 1:18), and mockery (Matthew 27:28). 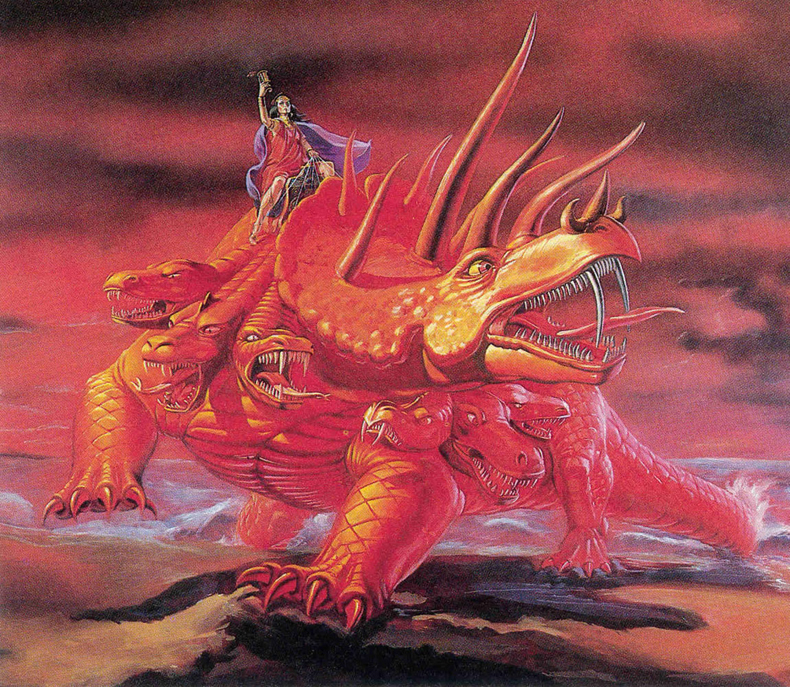 Consider also that the dragon she is riding is also scarlet. What could this indicate? Adorned with gold, jewels and pearls – This implies wealth, economic power, and could represent the corruption that has led civilization astray throughout history. It could also mean the harlot has ruled over many nations throughout history and this is the treasure. Consider also idolatry. Holding a golden cup of impurities, abominations and sexual immorality – This also has many meanings. This could certainly represent literal sexual immorality (and likely does) relating to a culture. In scripture this can also go hand in hand with idolatry. How might we interpret this in light of current events? A name of mystery on her forehead – Just as God seals his people with a mark and the beast seals with his mark, the harlot, here identified as Babylon, has a mystery name written on her forehead. John saw it but we do not yet know who, or what, it is. Drunk on the blood of saints and martyrs – Ezekiel 39:18-19 gives a description of feasting on the blood of enemies until drunk. Here, the enemies of the harlot are described as saints and martyrs—believers. This would indicate that the woman (nation) takes part in the mass murders of God’s followers. The ten horns are ten leaders who will receive authority from the antichrist to rule with the beast. They will hand over their authority willingly and they will wage war on God. Verse 16 says “And the ten horns that you saw, they and the beast will hate the prostitute. They will make her desolate and naked, and devour her flesh and burn her up with fire.” So, we can guess that the woman will not be one of the nations grouped together but a separate nation that will work with them even though they hate her. Does that sound familiar in world events today? Check out Jeremiah 4:30 too. Chapter 17 closes by telling us that these nations, working for the beast, are doing God’s will (though not likely on purpose). How can nations aligned with the beast be doing God’s will? Check out Romans 13:1. Chapter 18 is a declaration from Heaven that Babylon has been destroyed and received God’s wrath. Read chapter 18 for yourself.